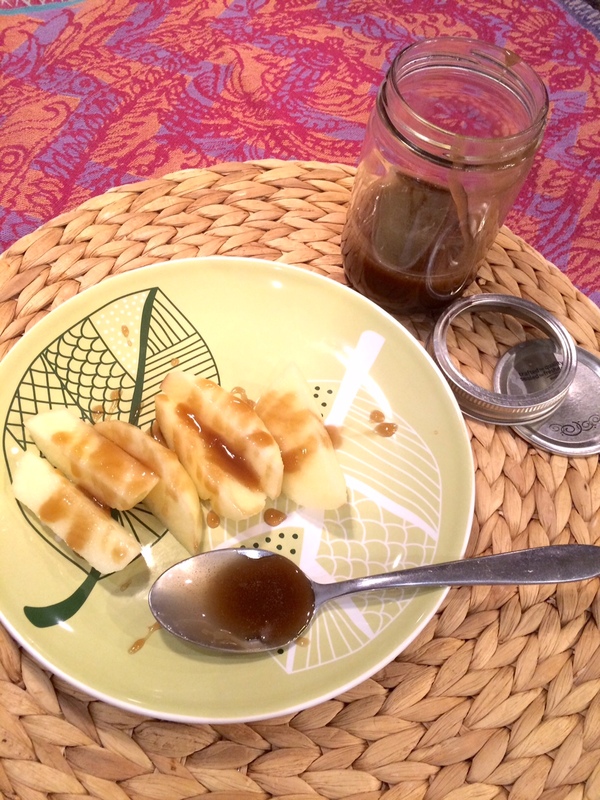 Lyndsay Johnson: Easiest Dairy Free / Vegan Caramel Sauce Recipe EVER! Easiest Dairy Free / Vegan Caramel Sauce Recipe EVER! In a saucepan, combine brown sugar, white sugar, almond milk, vanilla, and salt. Don't add the vegan butter yet! Cook over medium heat until sugars dissolve, then increase the heat to medium-high, and let mixture come to a boil. Stirring constantly (I used a tiny whisk), let the mixture foam and boil until it reaches a thick, but pourable consistency. This takes 5-10 minutes, but check it often to make sure it isn't burning. As soon as it starts to thicken, remove from heat (it will continue to thicken), and add the vegan butter. Stir to combine, and pour into glass jar or over dessert while hot. This caramel will thicken in the fridge overnight. If you were to dip an apple in it and leave it out on the counter, it would harden to a thick, sticky consistency, but never harden to a candy shell. WARNING: Highly addictive. Enjoy!